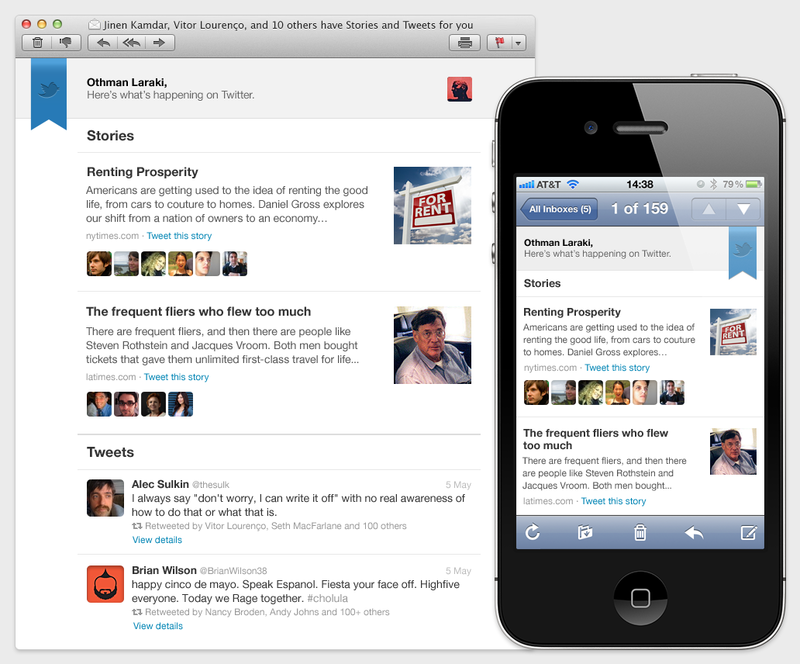 Yesterday, Twitter launched a new weekly email digest that it will be sending out to all members. Contained within are a few hotly shared news stories, the Twitter accounts that have shared them and some well-traded Tweets from popular users of the service. After its announcement, there was a lot of scoffing at the product. I mean, it goes against everything that Twitter stands for, right? It’s a static, staid collection of Tweets delivered up to a week after they’ve been sent out. This is so wildly opposite from the tenets of Twitter, some cried! The problem with this is that a lot of assumptions go into this that don’t hold up for anyone but heavy Twitter users. Most of the people who ‘just didn’t get it’ or actively hated it don’t seem to get that there are millions of Twitter users that don’t use it like we do. If you heard about the new digest before you got one in your inbox, there’s a good chance that you’re an obsessive user of the service, and a follower of news about it on top of that. Most people don’t use Twitter this way. They may never see 95% of the Tweets that pass through their timeline. Thanks to the common convention of Twitter clients that snips out chunks of the timeline to let you see a reasonable amount of tweets at a time, they’ll see some old ones, then some very new ones. But they may never see the ones in between. My brother-in-law works at a bank and only gets to check his Twitter maybe once or twice a day. He thumbs through a couple dozen tweets and closes the app. A weekly digest of hot Twitter stories would doubtless show him content that he would never have had the chance to see otherwise. Well, so what, right? What if he misses a couple of tweeted-about topics? The key here is that Twitter is trying to generate a sense of value for its users. What if he opened his Twitter client for a week of days and found nothing of interest the whole time. How motivated would he be to open it up during lunch the next week? The digest is a way to show Twitter users, those millions of newer, less experienced, or less engaged ones anyway, that there are things happening on the service. That there are people worth following and stories worth catching. There is also the fact that, under the second ‘Tweets’ section, you’re going to see tweets from people that you don’t follow, but that your friends do. This ‘friends-of-friends’ exposure will encourage users to expand their network. If you like the tweet, you might follow that account in the future. This user engagement problem is the same thing that Twitter tries to combat when you sign up for a new account and it tries very, very hard to get you to follow 5 people, then 5 more, and perhaps other people you know, etc. Twitter knows that these users’ Twitter account is only as good as the people they follow, and the digest is a way for it to help them see that maybe following a few more people would be a good idea. As Twitter expands from a role as a ‘nerd watercooler’ into an information pipeline and social service, it’s trying to make the transition from hundreds of millions to billions of users, and the digest is a smart move. It’s an educational tool and, from the ones I’ve seen so far, is formatted and presented beautifully using a tool built by the recently acquired Summify. But everything’s not wine and roses about the new digest. Twitter did make what I, and many other people, feel is a blunder when it added a separate tick box to disable it. This means that everyone, even those who had previously chosen not to receive any emails from Twitter, will be getting the digest. This is a silly move for a few reasons. First among those is that any user who is Twitter savvy enough to disable emails from the company is unlikely to benefit from the email. They’re not the target audience, period. In fact, by enabling the digest by default, all Twitter is doing is engendering ill will in its current, regular user base. It’s not as if Twitter had to make the same toggle control all email, it’s perfectly understandable that someone may want to get the digest but not daily spam. But making it obey the existing setting in user accounts would have been the better option by far. It’s unlikely that many of the users who will benefit the most from the new email will be missing out, as they’ve likely left their settings alone. Aside from that, however, the new email digest should help Twitter to continue its education process, not to gather new users, which it will do organically at this point, but to keep the ones it has and make them more engaged with the service. If you’re already hooked, well, it’s only a tick box away from oblivion.